I am now landscaping in Placer County and the Greater Sacramento Region and am actively looking for new clients. Anything from major improvements to the landscape to designing a landscape from scratch, to maintaining plants, trees, and water features on a regular basis. I can also do an hourly rate if the amount of work is indeterminable (big weed eating jobs, unknown drainage/irrigation issues, etc). The core mission of my design philosophy is sustainable maintenance, ideally self-sustaining. I can assist you with any aspect of your landscape, including drainage clearing, tree removal, re-barking, planting for color, or layering plants for effects of depth, or spilling effects. Planning a drip system to irrigate each individual plant to minimize water waste is easy work and ensures that each plant has the best opportunity possible to survive and flourish. I am also working into designing water features, so if you have a creative water job, I will be your lowest cost option. However with some bigger jobs, pools, large creek-beds, bogs, etc. I will need to hire outside assistance. My primary goal is to create sustainable landscapes that function well within the surrounding environment. I normally start with the basics. Drainage through the yard is important to maintaining the integrity of a house’s foundation. Drainage is the most essential aspect of a yard. Irrigation is the second, because this set the climate and availability of water for plants. Only once these conditions have been established should you begin planting. Then you can decide what climate to create to ensure the survival of the plants. Quality dirt and sun conditions for the plants to survive is essential. 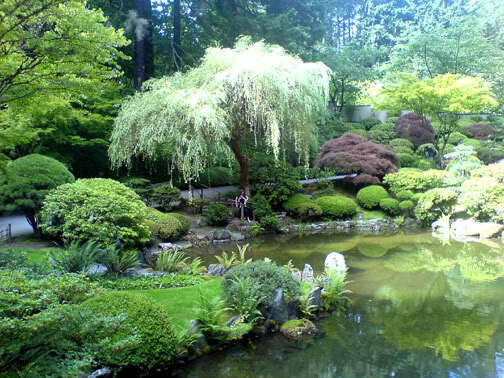 I plant in aesthetic patterns, odd numbers, and clumps, (this is normally a matter of clientele preference), proper fertilization, spacing, and planting, then add of bark, stone, etc. to create a balanced climate and control for pests and weeds. I prefer to use the highest quality materials as they make a big difference in the long run and typically last much longer than less expensive options. Oftentimes this includes landscaping fabric, sand, and pea-gravel to create proper drainage. The final decision for materials is always the client’s. Finishing Touches: Aesthetics, Maintenance, Repairs, etc. I perform a quarterly landscape cleanup service for several clients where I ensure that the landscape is functional and ready for another three months of survival in the elements. I do my best to keep the jobs focused on maintaining the plants, fertilization, weeding, and checking the irrigation and drainage; however, I sometimes spend a lot of time repairing irrigation, which is always an additional cost (parts and digging are usually required for irrigation repairs). But I am happy to do it at a low hourly rate. I aim for a unified aesthetic with the rest of the plants in the space. In my own designs I strive for a balanced effect with depth and color. Currently I am learning how to design Japanese gardens and have enjoyed learning about permaculture and farming for the last few years. I can help with most big projects! I maintain this yard so check back to see how it is evolving! It’s a beautiful landscape! This one was designed by a specialist landscaping designer.